These three smoothies are all nutritious and have their own unique flavors. They are easy to make as each only uses a few simple ingredients. 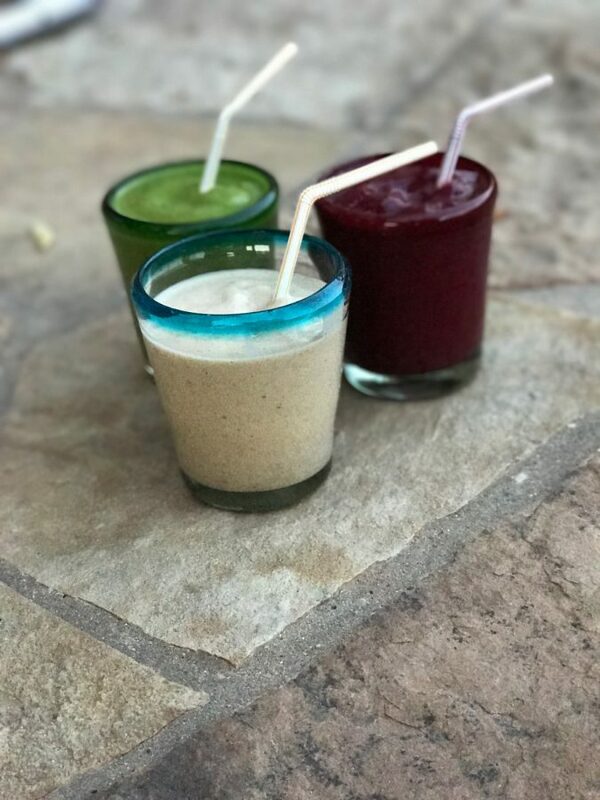 The cream colored smoothie in the front is the Peanut Butter Banana Smoothie, the green smoothie is the Tropical Green Smoothie and the dark purple smoothie is the Banana Berry Smoothie. Often times, eating healthy is associated with diets, restrictions and bland tasting foods. Preparing healthy dishes, however, does not have to happen at the expense of flavor. Below are three smoothie recipes, which span across a wide variety of tastes, providing anyone with at least one smoothie that they will love. Each with its own specific purpose ranging from getting in your serving of vegetables, to satisfying your sweet tooth or for giving you energy, these smoothies are equal parts delicious and nutritious.